We can assist with the opening of Chinese noodles soup shops. We manufacture products according to the standerds of the H.A.C.C.P system as well as export to USA, Taiwan and Southeast Asia. Because one of our main business is the manufacturing & selling of chicken products & processed food, we have a consistent business management system dealing with everything from breeding to processing and sale. Due to a consistently chilled system, we are a “delicious, healthy and reliable” food manufacturer. We use natural salt and good quality ion water. Planning, manufacturing and sales of Kurozu vinegar fermented in pots. Our Kurozu vinegar fermented from rice was the first in Japan to be recognized both as “Organic JAS” product and “Certified Local Food”. 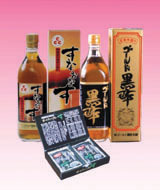 Using this vinegar “Sunaonasu” as a base, we manufacture safe goods. We manufacture and sell the Japanese traditional food, “Tsukemono” (pickles). It is healthy because it is high in fiber and low in salt. We produce “Satsumaage”(fried fish paste), and sell it all over Japan. We are particular about ingredients. We don’t use any additives and make delicious foods. We carefully select and use fresh fish & natural salt and produce goods through infrared light processing. We are the only rice powder dealing company that also manufactures and sells confectionery. We have the know-how to manufacture confectionery. 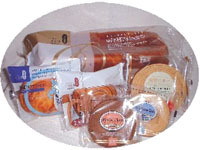 We produce and sell Miskaya Brand bread and Baumkuhen countrywide. We produce high quality goods such as “Satsumaage” (fried fish paste), made with 100% fish meat. We produce pickles using the tastiest in-season radish grown in southern Kyushu and sell them all over Japan. 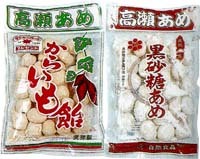 We produce radish pickles such as “Honboshitakuan” and “Tsubozuke”. We have a 90year history and expory pickles to Hawaii and Los Angles. We research and develop healthy food without additives. We are the leading corn industry in western Japan and we create business in various fields. NIPPON CARRAGEENAN INDUSTRIES CO., LTD.
We establish good relationships with countries in south -east Asia. We are the highest grade carbohydrate refining enterprise in Japan. We produce “Sakamoto Kurozu”, rice vinegar made in ceramic pots, which is abundant in amino acid and healthy. It was established about 200 years ago. ‘SEA AG JAPAN CO., LTD.
Our popular products, “Bontaname”(soft candy) and “Satsumaino (sweet potato) Caramel”, can be tasted in most contries. “Hyorokumochi” (rice paste cake), is eaten in Asian Area. We produce fiber-rich organic foods without additives. 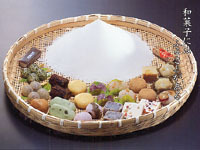 Manufacturing and sales of confectionery and natural food using raw sugar, the special products from the Amami area.